The market has drastically shifted…has your real estate buying business? Opportunity is here!Can you hear it knocking? Despite what some might tell you, investors that have shifted gears know exactly what they have to do to succeed today and they are buying up a storm. Don’t miss out! You can do it too. It’s not “magic.” It’s not “luck.” It’s not even “who you know.” Success in this market comes from applying a set of predetermined skills and strategies – or in plain language, “know-how.” And it’s downright formulaic. Once you have the formulas, you’ll know how to use them again and again in a market like this one. Ready to be a millionaire? Attend this seminar! Get crucial concepts, new buying strategies to explore, and even more ways to take your business to the next level in the next 24 months! Don’t sit on the sidelines and let this opportunity for true wealth-building pass you by! All it takes is the right “know-how” to take advantage of this hot market. 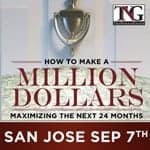 With decades of experience and proven investment savvy to his credit, Bruce Norris can give you the step-by-step strategies to exponentially explode your wealth in the currentCaliforniareal estate market. Sign up for this exclusive, one-day-only seminar today. Registration includes full-color manual and TNG web portal access for additional downloads including forms, scripts, and links.